Dorianne Laux is able to create narrative poems with natural line breaks that flow like summer breeze. They are easy to follow and use simple language, which makes them accessible to readers; she moves us. The ability to write accessible poetry is proof that Laux is an expert. She captures human sentiment and weaves emotions into multisensory landscapes with accurate details. Rich with detailed, layered poems, Only As the Day Is Long: New and Selected Poems is a collection of Laux’s finest. Laux is not afraid of grotesque details. She writes truthfully to engage readers with images we know. She commiserates. “Ode to Gray” is another example of Laux’s desire to capture comprehensive images, and then transforms them into metaphors. To ensure no doubt, she uses a list: “Mourning dove. Goose. Catbird. Butcher bird. Heron. / A child’s plush stuffed rabbit. Buckets. Chains . . . // Mushrooms. Dray horses. Sage. Clay. Driftwood. // Crayfish in a stainless steel bowl. // The eyes of a certain girl. // Grain.” The girl’s identification with gray images transforms the poem into a feeling of unavoidable, as if welcome, sorrow. 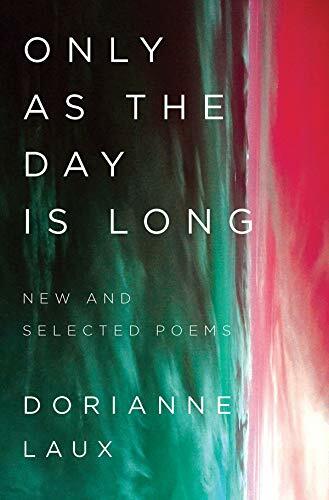 Containing selections from Awake, What We Carry, Smoke, Facts About the Moon, and The Book of Men, along with new poems, Only As the Day Is Long: New and Selected Poems is a necessary addition to a home library. The poems demand multiple reads, and they will never escape one’s memory; they are permanent.